As compelling as infrastructure technology upgrades can be regarding productivity enhancements, job creation, obtainment of efficiencies in both supply chain management and movement of people and goods; a much broader impact upon the overall economy and financial profile can potentially reap rewards at orders of magnitude. Innovation in products, processes, governance and financing techniques have the potential to grow business, improve governance, and; ultimately, over time, reduce the debt burden(s) enveloping society and many public sector entities. In modern day political discourse, there is general consensus among various actors that infrastructure needs to be funded. In the classic 1962 work, The Calculus of Consent, James Buchanan and Gordon Tullock asserted “at the ultimate constitutional level of decision, the implied requirement of consensus prevents the partisan struggle among group interests that characterizes operational decisions.” If we have both general consensus and implied consensus, what seems to be the impasse? The impasse may possibly be appetite for risk. If so, then offloading risk onto the private sector, which inherently possesses a greater appetite for such risk-return relationships vis-à-vis public sector may be a path forward. The price tag alone for U.S. infrastructure needs is estimated between $1.5 trillion and $5.5 trillion depending upon a host of issues. 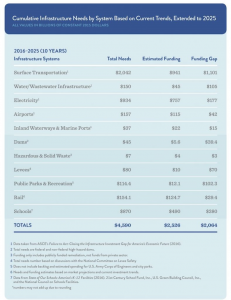 Notwithstanding the foregoing, when the total infrastructure overhaul price tag is combined with other budgetary demands at the federal level, as well as state and local levels, various actors are left with little room to maneuver. Meanwhile, business, government and society seem to be in consensus that infrastructure, from the neighborhood walkways to big, multi-state civil engineering undertakings, needs fixing. All three components are compelled to collaborate seeking mutually beneficial opportunities. The underlying common denominator with a potential for successful collaboration is innovation. But innovation by its very nature, is inherently risky. Therefore, a review of some of the underlying challenges contributing to the tie-in between infrastructure and innovation follow. According to the Business Roundtable, a one percent gross domestic product (“GDP”) growth rate per annum would be generated by U.S. infrastructure investment. Forecasting out to 2020, the increased GDP growth rate would yield $320 billion. Summarily, as much as $3 in economic activity could potentially be created by every $1 in infrastructure investment. The same figures could be applied to state and local (county and municipal) governments on a proportionate basis. Additionally, in 2017 Mckinsey and Company research suggests that GDP would rise by 20 cents in the long term for every $1 spent on infrastructure investment. The International City/County Management Association’s 2016 survey listed savings from budget, responding to customer needs as some of the main reasons for innovation and emerging practices in local government. Budget savings in some cases have led to targeted financings. Innovative financing techniques pertaining to various types of infrastructure have started to gain momentum. Various bond offerings such as Social Impact Bonds, Green Bonds, Private Activity Bonds and other debt instruments have started to move from nascent stages to actual underwritings, both tracked and sold in secondary markets. Federal credit programs such as Transportation Infrastructure Finance and Innovation Acts (“TIFIA”), Water Infrastructure Finance and Innovation Acts (“WIFIA”), Railroad Rehabilitation and Improvement Financing Acts (“RRIF”), as well as U.S. Small Business Innovation Research coordinated by the US Small Business Administration are serving as “go to” institutional financing sources for capital attraction for infrastructure project portfolios. 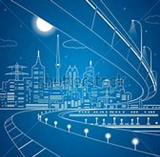 Innovations in public procurement regarding infrastructure are gaining momentum. Utilizing various public-private partnerships is indirectly addressing distributional intergenerational equity considerations. The value of maintenance contracts, once perceived to be the exclusive purview of operations are incorporating revenue streams (pay as you go; pay as you use) through their Value for Money analyses. Procurement types such as pre-commercial procurement, public procurement of innovation and No Bid are moving from conceptual framework to the marketplace. The US Bureau of Economic Analysis and the US Census Bureau State and Local Government Finance data suggest the trend line for infrastructure financing from 1987-2017 is increasingly migrating towards special districts and city(municipal) financing. In their 2017 article in “Public Budgeting & Finance,” Benson and Marks assert that actual accounting disclosures for infrastructure assets may skew actual financial profiles of state and local governments due to implementation of GASB 34 Governmental Accounting Standards Board Statement. GASB 34 requires infrastructure asset disclosures (status of assets such as bridges, levies, sewer, amongst others) but affords choice to state and local governments between depreciation approach and the modified approach. Modified approach requires disclosure regarding infrastructure status. Societal demands compel organizations to fully disclose activities and their requisite financial implications. As GASB 34 leaves some room for methods of accounting and reporting of infrastructure, the case now exists for creating an actual dollar figure for “unfunded infrastructure liability.”Akin to unfunded pension liability, unfunded infrastructure (and the requisite opportunity costs), can now be publicly reported. Society demands are forcing government and business to be accountable and therefore, transparency is becoming a competitive advantage, certainly when it comes to financing demands. As Tiebout asserted back in 1956 in his seminal article, “A Pure Theory of Local Expenditures,” people will vote with their feet and potentially relocate to another town/city possessing modern day infrastructure appeal, amongst other local public goods. Public perception amongst respective communities is an important consideration. Thus, status of infrastructure in communities becomes a localized matter. In many ways, the American marketplace for infrastructure is entering into a transformational stage. This transformational stage may be marked by inherent risk-taking, multi-beneficial collaboration, increasing transparency and in many circumstances, entrepreneurial type solutions. The birthplace for innovation is found within public infrastructure.